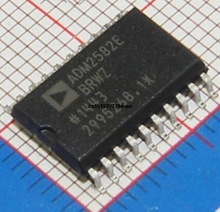 This ADM2582E, is a galvanic issolated RS485/RS422. I picked it because it was my only option for galvanic all-in-one. I was just checking it’s speed and it support 18Mbps and 256 Devices in a network. It cost ca 4.- USD compared to a few cents for MAX3485, and it’s a bit larger that MAX3485. You need ca 15 x 20mm PCB space for each of these. I have currently used them in two of my designs.